We'd bother with the obvious, but there's no sense in acting exasperated that this thing is finally shipping -- let's just be glad it didn't take a day longer, shall we? Second Sight, a California-based company aiming to help those with degenerative eye disease by way of technology, has finally seen its flagship product approved for "clinical and commercial use" in Europe. The product is the Argus II, and for all intents and purposes, it's a retinal prosthesis (read: implant) that can at least partially restore lost vision. It works a little like this: patients don the camera-laden glasses, where signals are grabbed and fed wirelessly to a chip implanted near ones retina. 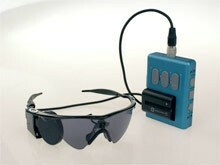 The information is beamed to around 60 electrodes that "stimulate retinal cells, producing light in a patient's view." According to Technology Review, "the process works for people with retinitis pigmentosa because the disease damages only the light-sensing photoreceptors, leaving the remaining retinal cells healthy." For now, the $115,000 device will only be available through a smattering of clinics in Switzerland, France and the UK. If all goes well, it'll be actively seeking FDA approval next year for use in the US of A, and a version with way more electrodes shouldn't be too far behind.